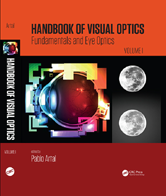 Handbook of Visual Optics offers an authoritative overview of encyclopedic knowledge in the field of physiological optics. It builds from fundamental concepts to the science and technology of instruments and practical procedures of vision correction, integrating expert knowledge from physics, medicine, biology, psychology, and engineering. 2.4 Can elucidating the fundamental mechanism of emmetropization help us prevent refractive error? 2.6 How good can the ophthalmoscope get? 2.8 Can optical technology help us disentangle the neural circuitry of the retina? 2.9 Can optical technology accelerate the next generation of cures for blindness? 3.1.1 What is geometrical optics?